In memory of Johnny Cash who died on this date in 2003, this is the obituary that I wrote for National Review after his death. Johnny Cash wrote those lyrics many years ago for his wife, June Carter. The song is entitled “Meet Me In Heaven” and it testifies to the irreplaceable bond of love, trust, and devotion that was shared by the couple throughout their 35-year marriage. On Friday, September 12, Johnny Cash died at age 71 of complications from his longstanding bout with diabetes. Nearly four months after the passing of his beloved wife June Carter, the legendary Man In Black discovered the answer to his lyrical question. It is strangely fitting that his last album, “The Man Comes Around,” will epitomize his legacy. It deftly embodied the gritty and brooding sound that marked his remarkable career. Although Cash justifiably received numerous accolades for his rendition of Trent Reznor’s song “Hurt” and its accompanying video, the title track of the album has been widely heralded as one of Cash’s greatest songs. “The Man Comes Around” is about the Day of Reckoning and the notion that there will be an accounting for the way in which we live on earth. It is described by Cash collaborator Marty Stuart as “the most strangely marvelous, wonderful, gothic, mysterious, Christian thing that only God and Johnny Cash could create together” – perhaps the finest tribute that can be paid to a songwriter. “Everybody won’t be treated the same,” Cash wrote, “There’ll be a golden ladder reaching down when the Man comes around.” The swinging ladder from above never was an unfamiliar sight to Cash — dodging death numerous times from drug-related addictions earlier in his career to health-related maladies in his later years. If American music had a Mount Rushmore, Cash’s distinctive profile would be prominently chiseled into the rock. He is most widely known for hits such as “Folsom Prison Blues,” “Ring of Fire,” and “I Walk the Line,” selling more than 50 million records throughout his career. He is the only person to be inducted into the Rock and Roll Hall of Fame, Country Music Hall of Fame, and the Songwriters Hall of Fame. His audiences have included presidents, prisoners, and everyone in between. Throughout his illustrative life, Cash wrote books, hosted a popular television show, starred in and produced movies, and recorded 1,500 songs that can be found on 500 albums. His appeal is recognized by everyone from rappers to roughneck steel workers because of his charismatic magnetism that has spanned five decades of popular culture. His songwriting orbited around the universal human condition of sin and redemption, murder and grace, darkness and light. His recent three-album collection is titled “Love God Murder.” What you see is what you get with Cash. There was never a manufactured feeling to his art. When he sang, you could almost taste the hillbilly moonshine, smell the gunpowder of a smoking revolver, and feel the drops of blood off the thorny crown of a crucified Christ. Of course, Cash spent his fair share of time behind bars for incidents surrounding his alcohol and drug use — mostly overnights in holding cells. He turned to drugs as his career began to take off in 1958. At first, he looked upon them as a divine favor from above. He once told Larry King, “I honestly thought it was a blessing — a gift from God.” But it did not take him long to realize that he was deceiving himself and that the drugs were trinkets of the Devil, luring him deeper into retreat mode from unresolved issues in his life. Back in the 1970s when he became more serious about his faith, Cash says it was Billy Graham who advised him to “keep singing ‘Folsom Prison Blues’ and ‘A Boy Named Sue,’ and all those other outlaw songs if that’s what people wanted to hear – and then, when it came time to do a gospel song, give it everything I had. Put my heart and soul into all my music, in fact; never compromise; take no prisoners.” Cash subsequently sang in the sold-out honky-tonks of the world and the jam-packed arenas of the Billy Graham crusades — never allowing himself to be too easily pigeonholed by the holy or the heathens. 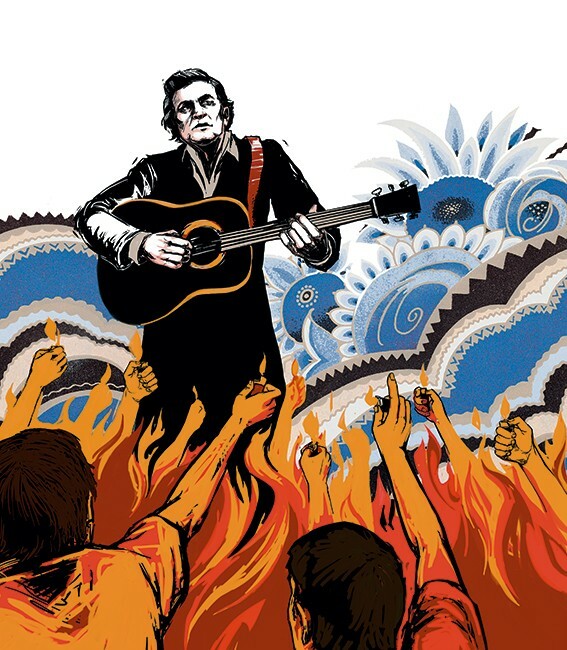 Johnny Cash was an irreplaceable American original who will be remembered as a cross between Jesse James and Moses – an enigmatic man in black, with a heart of gold, and a voice that could raise the dead. Now that the Man has come around for him, one imagines he’s met his June in Heaven.